Do you strive to go beyond your own roots to understand the history and culture of others? This is the perfect itinerary for you! You are in Tr’ondëk Hwëch’in country! Generations of Hän travelled a thousand kilometres every year to take advantage of the riches of the land. You won’t have to work that hard to get the amazing story of this thriving First Nation! 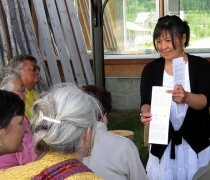 Take a guided gallery tour, sip some rose petal tea, hear a Hän song and meet the descendants of the Klondike’s first people. Searching for beaded treasures? The Hammerstone Gift Shop has beadwork from all over the Yukon. At the Zho ‘Home tan’ isn’t sun worship– learn of the techniques, skills and natural materials that make the very best regalia and cozy foot wear. 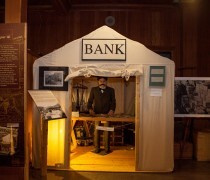 The Dawson City Museum is the perfect place to travel back in time and explore the history of Dawson City, the Gold Rush, and the Klondike region. It boasts the largest historical collection in the Yukon and features many interactive programs each day. Learn the fundamentals of finding, separating and melting gold with a Rockerbox and Gold Pour Demonstration. Cozy up to classic films on the Klondike, or wander through the South and North Exhibits. Be sure to check out one of Dawson’s hidden gems: the Train Shelter, which is home to four restored locomotives used in the Klondike from 1905-1913. Live out your childhood dream, and hop into the front seat of a historical fire truck! After a big fire in 1897 Dawson City realized the necessity of having an organized fire brigade. 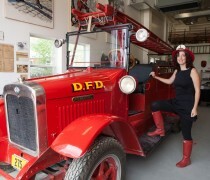 With that, the first steamer was delivered to Dawson, and the Dawson City Fire Brigade went into permanent organization! They have accumulated a lot of historical fire engines and equipment over the years, and this is your chance to see it all! Watch where you park though… the real Dawson City Fire Department operates out of the same building, and is ready to serve!